We kick off your child’s birthday party with an interactive hoop show to wow the guests. 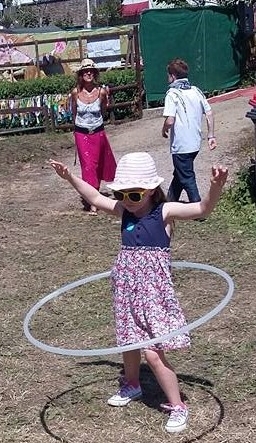 Then we give the kids (and any brave adults) clear and fun instruction on hula hoop tricks they can do on the body and in their hands. We finish the birthday party with a hoop show where everyone can demo their new skills to great applause! Your kids will need room to spin so we recommend a large area for the party – a local church or school hall work well. A park or large garden are also great but you’ll need a back up plan for wet weather. We can recommend venues or hire one for you for an additional charge. Surrey including Kenley, Caterham, Croydon, Purley, Reigate, Redhill. Jersey in the Channel Islands can also be catered for in advance. Each party is different so please fill in the enquiry form below for a quote. Pricing will depend on location, length of time and number of guests. We can also provide a gift hoops for the birthday girl/boy and for all guests as an optional extra. All our children’s entertainers are DBS checked and hold full public liability insurance.